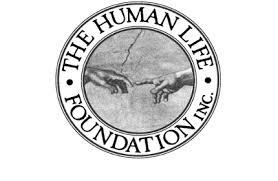 Wesley J. Smith wrote an article called "That Unrepentent Bigotry" for the most recent edition of Human Life Review (New York). It was republished by the Discovery Institute (Seattle) this past April (http://www.discovery.org/scripts/viewDB/index.php?command=view&printerFriendly=true&id=18701). The article is razor-sharp with truth, penetrating insight and solid conclusion. It's so typical of Wesley J. Smith's writing; He is one the most profound bioethical thinkers and prolific writers about bioethics and moral issues of our time. With Mr. Smith's permission I have posted "That Unrepentent Bigotry" below. For example, the worst forms of racist speech are now far beyond the pale—to the extent that the despicable N-word can no longer be uttered publicly without serious social consequences—even to popular entertainers—and racist jokes are, thankfully, mostly an ugly anachronism of the unlamented Jim Crow past. Meanwhile, most frown at sexist, homophobic and other epithetic utterances intended to demean whole categories of people based on personal characteristics or creed. Finally, after decades of effort and consciousness raising, Martin Luther King’s dream of a culture that judges people on the content of their character is encouragingly close to reality. But the news is not all good. Many of our brothers and sisters remain the victims of a pervasive but nearly invisible bigotry—and indeed subjected continually to profoundly demeaning and hateful characterizations—mostly without social protest, cultural opprobrium, or even notice by the usual enforcers of cultural comity. Indeed, the “hate speakers” may even be applauded or their denigration either not noticed or ignored, perhaps because the denigrators are often themselves unaware that they have engaged in hurtful rhetoric. How can anyone in good conscience and with love for their fellow man, refer to anyone as a mere “self-enclosed skin bag”—as if the person were no more meaningful morally than a leather wallet or alligator skin purse? Yet, because of the bigotry against people with disabilities is mostly invisible, odds are very good that Brooks was ignorant of the profoundly hurtful and denigrating nature of his words. We should also note the utilitarian ugliness implicit in the Brooks quote. If we are to remain a moral society, we must reject all assertions that our value comes from what we can do. Rather, we matter because of who we are, members of the exceptional species Homo sapiens, each of us—if Jefferson is to be believed—created equal and possessed of inalienable rights, simply and merely because we are human. Indeed, embracing the equal and intrinsic dignity of each individual—without resort to invidious categorizations—is the indispensable predicate to establishing and maintaining universal human rights. Some might think, what’s the big deal? Brooks did not have a malign intent. He surely doesn’t “hate” people with disabilities or the elderly experiencing the terrible difficulties of morbidity in the way the KKK hates people with dark skin. No doubt, that is true. But bigotry may actually be more damaging when it doesn’t emanate from a malicious heart, but instead, arises from a deeply held and almost unconscious conviction to which the prejudiced person is himself unaware. 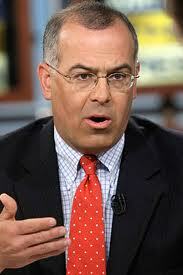 Brooks’ easy use of the deeply denigrating term, “skin bag,” fits that description. A large share of our health care spending is devoted to ill patients in the last phases of life. This sort of spending is growing fast. Americans spent $91 billion caring for Alzheimer’s patients in 2005. By 2015, according to Callahan and Nuland, the cost of Alzheimer’s will rise to $189 billion and by 2050 it is projected to rise to $1 trillion annually — double what Medicare costs right now. Hardly “obvious:” If one promotes the noxious notion that somebody disabled by ALS is merely a skin bag, and that the morbidly ill elderly or dying somehow have a moral obligation to choose to die sooner rather than later—“voluntary” will eventually have little to do with it. 1. Vividly depict the suffering of elderly, dying, and disabled people, etc. The point is for us to be both repulsed by the person being described and fearful of such a fate ever befalling us. 2. Dehumanize people we want to convince to jump (or push) out of the lifeboat. Hence, Brooks use of the skin bag pejorative. 3. Blame the sick, disabled and elderly for out-of-control health care spending, and on family discord and financial difficulties. 4. Pull back from the blatant dehumanizing with a hedge, saying that it is “obvious” you aren’t suggesting they be left on hills to die, just as Brooks did. 5. But then say we have to have a “serious conversation” about policies that will do figurative just that. Indeed, when you hear the term “serious conversation” in this context, it usually means that marginalized groups are being targeted for some form of oppression or abandonment. The idea, often subliminal, is that the time has come to put les miserables out of our misery. We have been here before—and not that long ago—with the Eugenics Movement and its poisonous progeny. Indeed, just as the abolitionists created an advocacy method to expand civil rights that remains effective today, eugenics activists similarly established an approach to stripping targeted groups of their equality, one that we are again following. First, eugenicists divided humanity between desirable and undesirable castes, based on supposed medical and scientific criteria. Thus, eugenics advocates divided people between the so-called “fit”—generally people like them—and the “unfit,” people deemed to have less moral value based on supposed lack of intelligence, moral degeneracy, race, ethnicity, disability, and the like. Next, eugenicists blamed the ills of society on members of invidious categories they had created. The 1920 German book, Permission to Destroy Life Unworthy of Life  (Die Freigabe der Vernichtung lebensunwerten Leben) was a classic case in point. 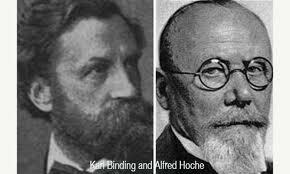 Its authors were two of the most respected academics in their respective fields: Karl Binding was a nationally renowned law professor, and Alfred Hoche, a physician and noted humanitarian. Permission to Destroy Life Unworthy of Life, in reality two extended essays, one by each author, was a full-throated assault on the Hippocratic tradition, human exceptionalism, and the sanctity/equality of life ethic. I have discovered that the average yearly (per head) cost for maintaining idiots has till now been thirteen hundred marks…If we assume an average life expectancy of fifty years for individual cases, it is easy to estimate what incredible capital is withdrawn from the nation’s wealth for food, clothing, heating – for an unproductive purpose. Permission to Destroy Life Unworthy of Life created a sensation among Germany’s intelligentsia and with the aid of their leadership and in conjunction with the growing acceptance of Social Darwinism, anti-Semitism, racial hygiene, and eugenics, the Binding/Hoche view soon was accepted by much of German society. For example, a 1925 poll of the parents of disabled children reported that 74 percent of them would agree to the painless killing of their own children. Finally, the negative public attitudes sown by open and accepted denigration of categories of human beings bootstrapped active oppression, exploitation, and killing, either by, or with the approval of, government. Thus, the concept of “life unworthy of life,” paved the way for the Nuremberg Laws, under which hundreds of thousands of Germans were involuntarily sterilized, and worse still, the murder of nearly as many disabled Germans as a “healing treatment” in Germany’s infamous euthanasia pogrom. A similar pattern victimized the “unfit” in the USA. By 1910, “eugenics was one of the most frequently referenced topics in the Reader’s Guide to Periodic Literature.” In its boom years of the 1920s, eugenics became a serious and influential scientifically supported social and political movement. Eugenicist societies formed for the promulgation and discussion of theories, academic eugenics journals sprouted, with eugenics advocacy supported financially by some of the country’s most notable philanthropic foundations. Courses in eugenics were taught in more than 350 American universities and colleges. Many of the most notable political, cultural, and arts figures of the era caught the eugenics virus, including Theodore Roosevelt, Winston Churchill, George Bernard Shaw, Clarence Darrow, and Helen Keller (! ), helping fuel the movement’s popular support. But eugenics didn’t reach full hurricane strength until the Supreme Court of the United States sanctioned forced sterilization as a public good. The infamous Buck v. Bell victimized Carrie Buck, who had been born-out-of-wedlock to a prostitute mother, and had herself given birth out-of-wedlock to an infant, perhaps after being raped by a foster relative, after which she was institutionalized. We have seen more than once that the public welfare may call upon the best citizens for their lives. It would be strange if it could not call upon those who already sap the strength of the state for these lesser sacrifices, often not felt to be such by those concerned, in order to prevent our being swamped with incompetence…The principle that sustains compulsory vaccination is broad enough to cover cutting the Fallopian tubes. Three generations of imbeciles is enough. Think about it. An American citizen, wholly innocent of any crime, was sterilized legally, an act of profound oppression sanctioned by her own government. Her daughter died in the second grade of an intestinal ailment. Her teachers considered her very bright. During her life, Carrie married twice, sang in the church choir, and took care of elderly people. She always mourned her inability to have more children. She died in 1983. 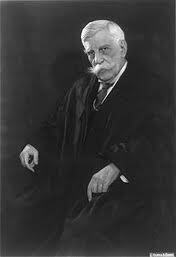 The Supreme Court’s imprimatur opened the eugenics floodgates. There were about 6,000 eugenic sterilizations in the United States between 1907-1927. 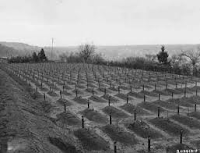 By 1940, the number had climbed to nearly 36,000. By the time eugenic sterilizations ended in this country in the early 1970s, nearly 70,000 of our fellow Americans had been sterilized, all under the color of law. Nearly everyone today acknowledges that eugenics was both pseudo-science and a shameful example of the oppression that follows logically from creating invidious categories of people deemed be less worthy of society’s protection. Today, no legitimate societal leaders advocate forced sterilization, and to be sure, murder is not viewed as a way to improve the quality of the human race. But there are other ways to fall off a moral cliff. The underlying bigotry expressed in eugenics advocacy continues to be wielded against some people to this day. To be more precise, the same categories targeted by Binding and Hoche as unworthy life remain vulnerable to widespread and societally approved disdain, expressed by culturally approved denigrating speech. Perhaps the best example of this phenomenon is the use of the word “vegetable” to describe people with catastrophic cognitive disabilities. Just like the worst racial epithet, the V-word intentionally diminishes, demeans, and most damagingly, dehumanizes. Yet, people who would never use the N-word in the understanding that it is not only offensive but oppressive, think nothing of describing their fellow humans as if they were mere rutabaga. Indeed, the V-word is used in popular entertainment without worry of experiencing the kinds of consequences that would befall any program that used the N-word in an approving manner. The popular television program, Family Guy, provides a particularly egregious example. The program literally mocked the late Terri Schiavo, who was dehydrated to death by court order at the request of her husband, because she was diagnosed as persistently unconscious. 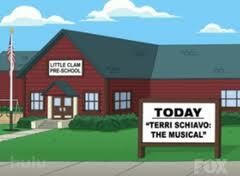 The episode opens with a fictional school play, Terri Schiavo: The Musical. In it, she is depicted as having been hooked up to every conceivable medical machine--in reality, all she needed to remain alive was food and water delivered through a tube. False history aside, the lyrics sung by the characters are truly beneath contempt both in their jeering of Terri’s memory, and by logical extension, of those now living with serious cognitive impairments. “Michael Schiavo” says, “She’s a vegetable,” and the chorus responds, “We hate vegetables!” to which the audience roars laughter. Later Terri is depicted as having “mashed potato brains,” which are poured into a bowl, and is described as “the most expensive plant you’ll ever see.” Now imagine what would happen if the same level of denigration was directed at AIDS patients. You can’t because it wouldn’t—and shouldn’t—happen. Such bigoted attitudes extend far beyond popular entertainment. The use of the “V-word” continues to be used among the most “enlightened” public intellectuals. 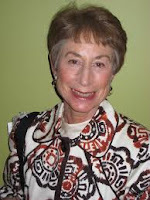 For example, in an interview published in the New York Times, the noted author Jane Brody used the word in discussing a book she wrote on planning for death. Start thinking about it when it’s unlikely to happen any time soon. It’s much easier to do it then. It’s less painful. Get it out of the way. Many people are saying, “I’m going to take action now while I still feel good and I’m still healthy.” You don’t have to be old. If you recall, Terri Schiavo was 26 when she suffered a heart attack that deprived her brain of oxygen and left her a living vegetable for 15 years, at great cost and trauma to her family. Dame Joan Bakewell says she does not want people to be kept alive because of machinery when their ‘identity has ceased to exist.’ Old people should be allowed to die if they become ‘vegetables’, Joan Bakewell has said. Labour’s czar for the elderly said she had made a living will that will mean she is ‘not kept alive if I’m a vegetable’. She added that people should not be helped to go on living by machinery if they had outlived their normal lifespan. The 75-year-old television presenter also called for laws that would allow terminally ill patients to be given fatal doses of drugs. She doesn’t want people kept alive. 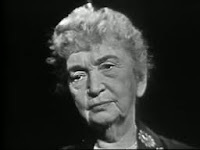 When a public official possessing such a discriminatory mindset toward people with disabilities and the elderly is appointed to high office, when she openly disparages the helpless with a hateful epithet intended to dehumanize and degrade, when she promotes euthanasia and what can only be called a duty to die–and she is considered the voice of the elderly–trouble is definitely coming! And it gets potentially worse. Since people feel free to use the V-word so casually, we should not be surprised that some advocate policies that treat people as mere plant matter—meaning, ripe for the picking. If the legal definition of death were to be changed to include comprehensive irreversible loss of higher brain function, it would be possible to take the life of the patient (or more accurately, stop the heart, since the patient would be defined as dead) by a ‘lethal’ injection, and then to remove the organs needed for transplantation subject to the usual criteria for consent. Outright killing of the cognitively disabled is also openly advocated in respectable public discussion forums. The Huffington Post--which has millions of readers--published a piece entitled provocatively, “How Would the Rainforest Handle Alzheimer’s Disease?” written by a religion writer named April L. Bogle. Reflecting the kind of social Darwinism expressed by Margaret Sanger, Bogle advocated the propriety of killing people with Alzheimer’s disease and the morbidly infirm. In a nursing home, there is no system for life and death except the endless waiting. The rainforest, on the other hand, has it all worked out. Obviously it is a brutal plan, but I argue no more horrendous than the “care” people endure in a nursing home. In the rainforest, everything is about survival — from being eaten, from lack of sun or water, from limited nutritious soil…Is this more brutal or terrifying than an Alzheimer’s home? At least in the rainforest, nature is in balance and everything is there for a purpose. It is a highly complex system of interconnectedness and interdependency that functions perfectly when left on its own. And here I thought that the mark of human progress and civilization was how we had moved beyond the merciless tooth and claw of the natural world. So what can we learn from this [rainforest patterns of life and death]? That unnatural ways of extending life aren’t necessarily a good thing. There is no design for handling the prolonged decline and decay, and this is breaking down some vital systems. The cost of care is draining Medicare and Medicaid coffers and threatening their continued survival. Family finances are being wiped out, forcing relatives who are living full and productive lives to sacrifice their possessions and downscale their activities. Once vibrant family caregivers are dying earlier than their sick loved ones, zapped of energy, creativity and vitality. No way am I suggesting we leave our loved ones to die and let nature run its course like the rainforest would. But I am urging our society to create a responsible plan for cleaning up the mess it has made. Just as the rainforest is an ecosystem that naturally balances its life cycle, so too can our society be intentionally restructured to provide more humane end-of-life options for people stuck in the “new old age. Like what? Very elderly people and their surrogates can and do refuse medical treatment any time they want. No antibiotics, for example, DNR orders in the event of heart failure, no kidney dialysis, etc. Moreover, often advanced Alzheimer’s patients and their counterparts don’t need life-extending medical treatment. They need personal care: food and water, warmth, proper hygiene, etc. So, what can she be talking about? Why, killing of course. We need to start a serious conversation among religion and law, and the health sciences and the human sciences, to figure out how we can let people die in a way that allows human reason and decision-making to play a major role. At the very least, we should allow people to determine — when they are still of sound mind and body — what they would like to do when they reach the point of no return, either mentally or physically. This “Enhanced Advanced Directive” would be legal for health care providers to follow, even if it calls for assisted suicide. There are between 2.4 and 5.1 million Alzheimer’s patients in the USA today. Are we really prepared to overdose hundreds of thousands of people when they reach advance stages–or help them kill themselves while still competent? Activists and their supporters who struggle against racism and other forms of discriminatory thinking have long understood that the words we use express how we think, which in turn, leads to action being taken--both private and public. 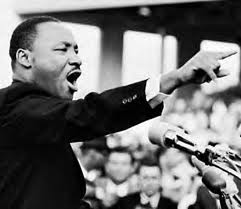 By working to make racist and similar epithets beyond the pale, activists like Martin Luther King understood that better behavior would follow—and so it has. Yet, there remains in society one group of people who are still mocked, dehumanized, marginalized, castigated, blamed for woes, and subjected to threatened actions that present a clear danger to their lives and futures. If we are to have a truly equal and moral society, if our health care system is to have any chance of caring properly for the least of those among us, to use a Biblical turn of phrase, we need to watch our mouths and cleanse our hearts. Associated Press, “Richards Says Anger, Not Racism, Sparked Tirade, November 22, 2006. See, for example, John Hardwig, “Is There a Duty to Die?” Hastings Center Report, March-April, 1997. Edmund Black, War Against the Weak: Eugenics and America’s Campaign to Create a Master Race, (New York, Four Walls Eight Windows, 2003), p. 127. Karl Binding and Alfred Hoche, Permitting the Destruction of Life Unworthy of Life: Its Extent and Form, (1920, Felix Meiner Verlag, Leipzig, Germany) as reprinted in Issues in Law and Medicine, Vol. 8, No. 2, (1992), pp. 231-265. Daniel V. Kelves, In the Name of Eugenics: Genetics and the Uses of Human Heredity, (Cambridge, Harvard University Press, 1985), 10. Kelves, In the Name of Eugenics, Supra. p. 112. “Three Generations of Imbeciles in Enough,” editorial, Detroit News, December 16, 1992. Black, War Against Weak, Supra., p. 123. Fox Broadcasting Television, The Family Guy, March 21, 2010. 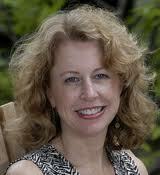 Tara Parker-Pope, “Planning for Death When You’re Healthy,” New York Times, March 20, 2009. Daily Mail Reporter, “Old People Should be Allowed to Die If They Become “Vegetables,” Czar for the Elderly Dame Joan Bakewell Says, Daily Mail, November 18, 2008. For example, see P Hoffenberg, et. al., for the International Forum for Transplant Ethics, “Should Organs from Patients in Permanent Vegetative State be Used for Transplantation?” The Lancet, Vol. 350, November 1, 1997, 1321. April L. Boggle, “How Would the Rainforest Handle Alzheimer’s Disease?” Huffington Post, August 6, 2011.